Every Friday the prompt goes up and #fmfparty slows down. We breathe out our hearts, sharing the hurts and the joys and splitting hearts and words wide open. Come join us? During the month of October, I’ll be doing my darn best to fit the FMF prompt with 31 Days: Every Story Matters. I don’t want to miss the now because I’m looking for the new. It’s true, God is always up to something new in our lives. He is always at work. And yep, after four years of praying for the same thing, God gave me my own personal miracle. He did the flat out impossible and mended the broken, bringing beauty from ashes. I’m not saying He won’t do that for you. Actually, I think He longs to do just that. But if we keep our eyes on the future, setting our hopes on tomorrow and refusing to deal with today, we’re missing the point. He is at work in the now. He is moving in the now. He is loving, shaping, changing us in the now. And when we realize that, we’ll see that the now becomes new. We are constantly becoming a new creation in Him. Oh I know, we go from death to life and from dark to light, but I believe He is still writing and working and molding us into His likeness. And that’s the secret in it, that the Now Us becomes the New Us. He’ll tell you where to look when it’s time. He will point out the New Thing and you’ll simply stand in amazement because once again, He has given and done immeasurably more. But until then can we just stop and look at the cross? Can we whisper that we love Him even though we haven’t seen Him? Will you rest in the truth that your story matters in the now? 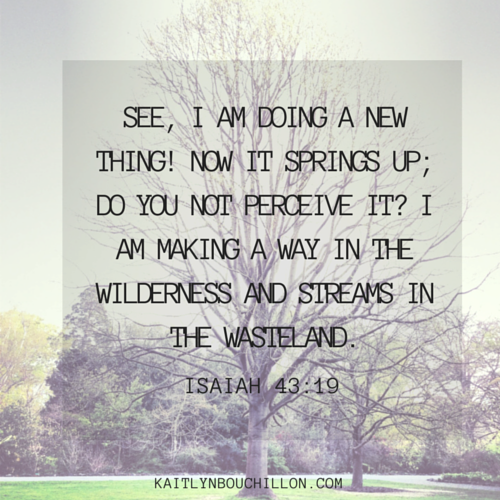 He is doing a new thing but let’s not ignore the now for the new. THIS IS DAY THREE. YOU CAN FIND THE ENTIRE SERIES –> HERE. I love your writing too. I keep remembering, that I haven’t seen Him, but I have seen His miracles. I have seen His Grace. I have felt His amazing love. I love your writing and your thinking processes. A great reminder, because this is an easy trap to fall into. We look forward to the New, but without the Now, there can be no New. Exactly! We need the now to reach the new.